Harvest is more than okay in Sonoma: weather is cooler than Napa because of the Pacific Ocean influence; traffic is not as severe as Napa because the table is spread over a bigger slice of geography; and the early Autumn farmers markets are better in Sonoma than anywhere else because so much of the county grows specialty fruits and vegetables for the high-end restaurant trade. There are also a lot of really worthwhile festivals during Harvest in Sonoma. They start Labor Day Weekend, which is about a week to ten days after the crush for sparkling wines begins. First up is the Sonoma Valley Harvest Wine Auction. It is about 10% of the size of the Napa Valley Auction (although still hundreds of thousands of dollars to charity), but they do have a lot of fun with winery principals involved in dance performances and many winery dinners, in addition to the auction. On the 10th through the 12th the Natl. Heirloom Exposition is held in Santa Rosa. That is a very large convention of seed savers, who come from all over the country to display their rare and endangered produce. Attitude Organic is largely assumed. One week later the town of Sonoma hosts a Plein Art Festival, wherein paintings are created in the same week-long period they are sold. The Guerneville Blues Festival is held the next weekend, and the Heirloom Tomato Festival the weekend after that. 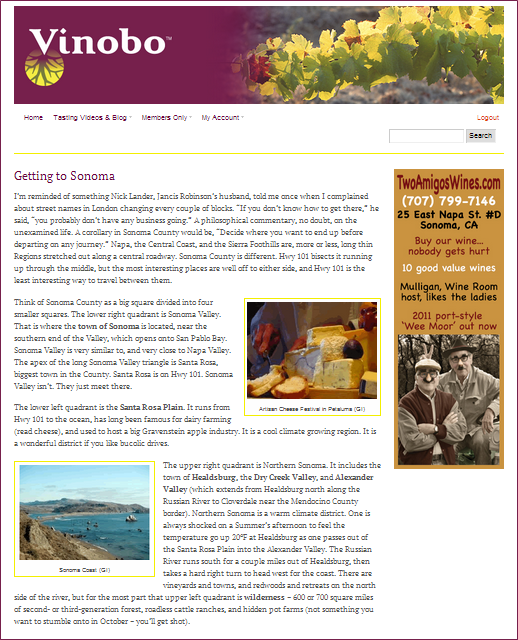 Sonoma is a fabulous place to be during Fall as the Harvest, both grapes and all manner of other fruits and vegetables, is concluded and moved into restaurant kitchens. Wineries have special events, and restaurants put on one-time-only menus featuring ingredients they don’t get on a consistent basis. The weather does get colder, and it starts to rain, but all the activity moves inside at wineries, so a sweater and boots will usually make you comfortable. It is the number one best time to see the business of winemaking up-close and personal. Fermentations are going on, wine is being pressed off the skins, barrels are being filled… It is not as nerve-racking as harvest, when a change in the weather can destroy carefully laid plans, but it is exciting to see a year’s worth of toil finally start to reveal aesthetic results. A tremendous amount of work goes on, and it is very long hours for the winemaker and his/her staff, but sales people have pretty much already made their bed. Christmas is the date winemakers want most wines cleaned up and safely ‘barreled down.’ Halloween is the deadline by which most sales people would have needed to have made deals for the upcoming Holiday season. So sales people are better able to spend time with you in Tasting Rooms during Nov and Dec than they are during Harvest. Middle of November is also opening of Dungeness crab season along the California coast. That’s a price and freshness issue. Dungeness crab will have been available in markets earlier, but those crabs will have come from Alaska for all intents frozen. Legally they can be called ‘fresh’ if they are transported at 28ºF, but no matter what name is attached, it’s still like kissing your relatives. What you want is ‘live’ crab. And I mean kickin’. Shoehorning the phrases ‘live’ and ‘cooked’ into the same crab promotion is a hoax. You want crabs that, if set on the ground, will walk away. And you don’t want to pay $8.95 per pound, because you’re going to want crabs that go at least two lbs each. For a group of people you’re going to want several of them. You want to see them swimming in an aquarium at the Chinese grocer for under $5.00 a pound. If the meat doesn’t stick between your teeth, you didn’t get the genuine article. Serve with garlic in melted butter. Or with sourdough bread and Best Foods mayonnaise whipped with a little lemon juice. Match to a high-acid, aromatic white wine with just a hint of residual sugar: Riesling, Pinot Gris, Chenin Blanc, Roussanne, Gruner Veltliner, sparkling wine. For Thanksgiving serve Gewürztraminer (dry, if possible) and Pinot Noir. Most Winters in Sonoma County are mild. Under El Nino conditions, which only come along every six to ten years, there may be numerous consecutive days of rain, but temperatures will reflect the tropical source of that moisture (i.e. days between 40º and 60ºF). Which is not to say there won’t be flooding and lots of hand-wringing by TV commentators. These events, however, are very much the exception. Unless you are a property owner along the Russian River, your personal discomfiture will likely be minimal. Same with freezing temperatures. They do occur in Sonoma County, but only rarely, and then mostly at elevation in the mountains. By the middle of February, acacia trees will be bursting out in profusions of bright yellow blossoms. Why, there may even be some daffodils starting to poke up. In short, Winter is a great time to visit wineries. You will be indoors. Crowds will be limited. Winery people will have time to sit with you and converse. You can get entertaining and useful information. Very worth your while. On the culinary front, I can not recommend strongly enough a trip south on Hwy 1 to visit the oyster farms of Tomales Bay in Marin County. Winter is a real good time for oysters on the half shell, because they are in ideal condition. If the weather is bad, you can go to any one of several restaurants. But chances are the weather will be clear and sunny. Perfect for sitting on a driftwood log with a bottle of Sauvignon Blanc from the Sonoma Coast, a shucking knife, a dish towel, and a couple dozen fresh ostrea. March 7th is Luther Burbank’s birthday. In California it is celebrated as Arbor Day, although tours at his home in Santa Rosa don’t begin until April. The weather will be cool but comfortable, punctuated by a day or two each week of spectacular 70º days with clear views that let you see 30-40 miles from any hilltop. The oysters are still in great condition, and all the deciduous trees are in flower. Professional baseball is on the radio. Hills are green, and lambs are gamboling all over them. It’s a photographers’ dream ~ perfect time to capture those monumental old Zinfandel vines as they awaken for yet another year. Flower stalls open up all over the county, and it’s the season for rhubarb and strawberry pie. Try a piece with Grenache Vin Gris (the lightly rosé wine pulled off the skins in the saignée process). Actually it is a time of some trepidation for Sonoma County vineyardists. Grape varieties such as Pinot Noir and Chardonnay tend to push buds earlier than Cabernet or Zinfandel. Frost danger is a big economic concern. Pay particular attention to low-lying swales where cold air will accumulate. Note wind machines to turn that air over, and the prevalence of irrigation sprinklers, which can put an insulating coat of ice on the vines (sounds counter intuitive, but it works if you only need overnight protection). Historical records consider 20 April to be the end of frost season in Sonoma. Compare that date to Mother’s Day (around 10 May) for the conventional end of frost season in the Sierra Foothills. Of course Napa did have a severe frost on 20 May in 1970, and the Sierra Foothills had several inches of snow on 4 June in 2011. So you never know. End of March brings the Artisan Cheese Festival to Petaluma, which is not only a culinary treat, it is a big business convention for many Sonoma and Marin County cheese practitioners (27 in 2011, up from seven in 2005). Names like Laura Chenel, Rouge & Noir, Humboldt Fog, and Bellwether Farms are known nationally. Goat and sheep ranchers come to write milk contracts, and chevre makers come to find deli and restaurant customers. There are seminars on raising animals for milk production, and classes on internet marketing. Note as well ‘April in Carneros,’ which is a weekend festival made somewhat unique by its cross-border (Napa and Sonoma) participation. Good time for wildflowers in Carneros. May is the Burbank Rose Parade in Santa Rosa, more or less marking the beginning of Summer. The parade is a community event tailored to families with small children. It ends at a large park picnic with music and many entertainments. 2013 will be its 119th year. The wine industry in Sonoma County has been around longer, but it’s still quite an accomplishment. In the vineyards, bees are doing all the heavy lifting. New releases are all on display in the winery Tasting Rooms. Tuesday night concerts start on the Square in Healdsburg, and run through August. In 2013 the North American Open Croquet Championship will be held at Sonoma-Cutrer Winery May 13-18. June is the beginning of salmon season for tour boats leaving from the coast. During mid- and late-Summer fog will be drawn in to the coast most afternoons around 3:30. Hence, shoreline activities which involve ‘catching rays’ (i.e. exposing skin to the sun) are best practiced during this May-June season before fog cover becomes an issue. Certainly it is the best time for strenuous activities, such as bicycle riding. You can rent bikes in Healdsburg, and find many country lanes (such as West Dry Creek Road) which afford stretches of automobile-free pleasure. In the town of Sonoma there is a several-mile long bike path which rolls through wineries, vineyards, and historic parts of town. Summer is vacation time all over our six California Wine Regions, but I like it best in Sonoma County. I love their Bocce Ball League in Healdsburg, and funky little theater productions in Guerneville (which is colonized each Summer by the gay population of San Francisco with their large discretionary incomes and impeccable good taste for interior decor). I love playing Liars’ Dice at the Union Hotel in Occidental (which is as close to the Summer Encampment at Bohemian Grove as I’ll ever get) before a wonderful Italian family-style meal. I love the lazy ambiance of floating through the hot Alexander Valley on the cool Russian River in an inner tube ~ which used to be for me about unusual bottles of wine and girls in skimpy outfits; now for me it’s glasses of well-aged wine and speculating with my friends about the price of riverside real estate. There is the charmingly parochial 4th of July morning parade at the Plaza in Sonoma (everyone from age 3 to age 90 on their favorite vehicle ~ 2 laps), and the very elaborate fireworks display a block away that night. There are visits to Luther Burbank’s garden at his house in Santa Rosa, and to his Experimental Farm, where hundreds of the plants he devised are still growing. Gravensteins are the earliest ripening apples anywhere. They are a wonderful apple because they have such an intense perfume, but that is also their liability because they lose it when stored or traveling to market. The apple industry in America is steadily succumbing to Chinese competition for a number of reasons. This means Gravenstein orchards of western Sonoma are gradually being turned into vineyards and into five-acre weekend homes with a few remnant trees. But none of these predatory circumstances diminish Sonoma’s ability to shine in mid-August with that rare and fleeting pleasure: fresh Gravenstein apple juice. Eating the apples is nice too, but you can only eat a couple. Gravenstein hard cider is okay, but it’s difficult to retain the unique nose. The juice, however, is tremendous and one can savor a small, chilled glass of it eight, ten times a day for several weeks. The Gravenstein Fair in Sebastopol is held right around 10 August. Beware, this event could ruin you for other apples. When it gets too hot, you can be at the Sonoma coast in half-an-hour. Both feet in the ocean, and an afternoon fog intrusion solving the temperature issue right now. It’s rockfish season all Summer long. Rockfish are caught on a line from a small dinghy in water less than 300 feet deep. It is a recreational mainstay for fourth- and fifth-generation locals. Rockfish are delicious in direct proportion to how ugly (prehistoric really) they look. Few meals can compare to sautéed Ling cod with ginger and scallions, crook squash and vine-ripened Zebra tomatoes with garlic and Parmesan, and a bottle of Chardonnay from the Russian River district, consumed on the deck of a Sonoma coastal village while the setting sun plays peek-a-boo with resident harbor seals. Sure it’s atmosphere, but the fish really does have lots of flavor, and it only lives on the Pacific coast. At the Chinese fishmonger, Ling cod fillets will be so fresh, they’ll still be twitching.